References UT_Win32LocaleString::c_str(), UT_Win32LocaleString::fromUTF8(), Stylist_tree::getNameOfRow(), Stylist_tree::getNumCols(), Stylist_tree::getNumRows(), Stylist_tree::getStyleAtRowCol(), AP_Dialog_Stylist::getStyleTree(), UT_UCS2String::length(), XAP_Win32DialogBase::m_hDlg, pt_PieceTable::s_getLocalisedStyleName(), AP_Dialog_Stylist::setStyleTreeChanged(), AP_Dialog_Stylist::updateDialog(), UT_ASSERT_HARMLESS, UT_DEBUGMSG, UT_SHOULD_NOT_HAPPEN, UT_UTF8String::utf8_str(), and xxx_UT_DEBUGMSG. Referenced by _populateWindowData(), and setStyleInGUI(). References _styleClicked(), AP_Dialog_Stylist::Apply(), destroy(), AP_Dialog_Stylist::setStyleValid(), and UT_DEBUGMSG. References _DS, _DSX, _populateWindowData(), XAP_Win32DialogBase::centerDialog(), XAP_App::getStringSet(), XAP_StringSet::getValue(), hTreeProc, XAP_Win32DialogBase::m_hDlg, XAP_Dialog::m_pApp, s_treeProc(), and XAP_Win32DialogBase::setDialogTitle(). References Stylist_tree::getStyleAtRowCol(), AP_Dialog_Stylist::getStyleTree(), XAP_Win32DialogBase::m_hDlg, AP_Dialog_Stylist::setCurStyle(), UT_DEBUGMSG, and UT_UTF8String::utf8_str(). Referenced by _onCommand(), and s_treeProc(). References AP_Dialog_Stylist::m_bIsModal, XAP_Win32DialogBase::m_hDlg, XAP_Dialog_Modeless::modeless_cleanup(), and UT_ASSERT_HARMLESS. References AP_DIALOG_ID_STYLIST, XAP_Win32DialogBase::createModal(), AP_Dialog_Stylist::m_bIsModal, XAP_Dialog::m_id, and UT_return_if_fail. 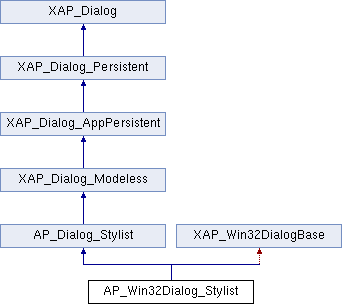 References AP_DIALOG_ID_STYLIST, XAP_Win32DialogBase::createModeless(), XAP_Dialog::getDialogId(), AP_Dialog_Stylist::m_bIsModal, XAP_Win32DialogBase::m_hDlg, XAP_Dialog::m_id, XAP_Dialog::m_pApp, XAP_Dialog_Modeless::m_pDialog, XAP_App::rememberModelessId(), UT_ASSERT_HARMLESS, and UT_return_if_fail. References _styleClicked(), AP_Dialog_Stylist::Apply(), and hTreeProc. References _fillTree(), Stylist_tree::findStyle(), AP_Dialog_Stylist::getCurStyle(), AP_Dialog_Stylist::getStyleTree(), AP_Dialog_Stylist::isStyleTreeChanged(), XAP_Win32DialogBase::m_hDlg, AP_Dialog_Stylist::setStyleChanged(), UT_UTF8String::size(), AP_Dialog_Stylist::updateDialog(), UT_DEBUGMSG, and UT_std_string_sprintf(). Referenced by _populateWindowData(), and notifyActiveFrame().